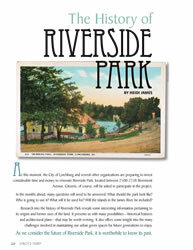 Before anyone “owned” Riverside Park, this area of Virginia was part of Monacan Indian territory. There was a big encampment of Monacan Indians several miles up the James River, not far from Holcomb Rock, but on the Amherst County side, in Bethel. There is now a park and public river access on that site called Monacan Park. It is easy to imagine Monacan Indians fishing in the river and spending time on the small islands just off what would eventually become Riverside Park. In 1624, when Virginia became The Colony and Dominion of Virginia, the land belonged to England. Ownership next passed to John Bolling, a descendant of Pocahontas and John Rolfe. At this point in time, the upper James River at Lynchburg was called the Fluvanna River, named for Anne, the daughter of King James II, who became Queen of England from 1702-1714. Lynch's Ferry is on sale at the following Lynchburg locations: Barnes & Noble, Bookshop on the Avenue, The Design Group, Given Books, Inklings Bookshop, Lynchburg Visitors' Center, Macon Bookshop, Old City Cemetery, Point of Honor, and Tom Jones Drugs. Heidi James moved to Lynchburg with her husband, Blitz, a Lynchburg native, in 1989. She is a former executive director of the Lynchburg Historical Foundation. She is currently the president of Rivermont House, Inc. and serves on the executive committee of the Lynchburg Garden Club. Research for this history was drawn from several sources, including the City of Lynchburg Clerk’s Office, the city Map Room, the Jones Memorial Library, and the Amherst County and Campbell County Clerk’s offices. The author wishes to extend a special “thank you” to Catherine Madden for help in researching old city records, Tom Ledford for reviewing the article and pointing to clues, and Al Chambers for reviewing the article and making suggestions for its improvement.